Can I create review categories for my students in Peergrade? The categories feature allows you to control how reviewers are allocated to submissions. You can enable Categories for allocation by going to your assignment settings and click on Categories in the sidebar. Categories are included in our Pro subscription. We highly recommend reading through the whole article to get a good grasp of how the feature works before you start using it. When the categories feature has been enabled you can add categories by clicking the New category button. You will need at least two categories before it will be saved. If you have used categories in a previous assignment you can reuse them. Click on the Copy categories button. You will get a popup window from where you can select the assignment to copy categories from. 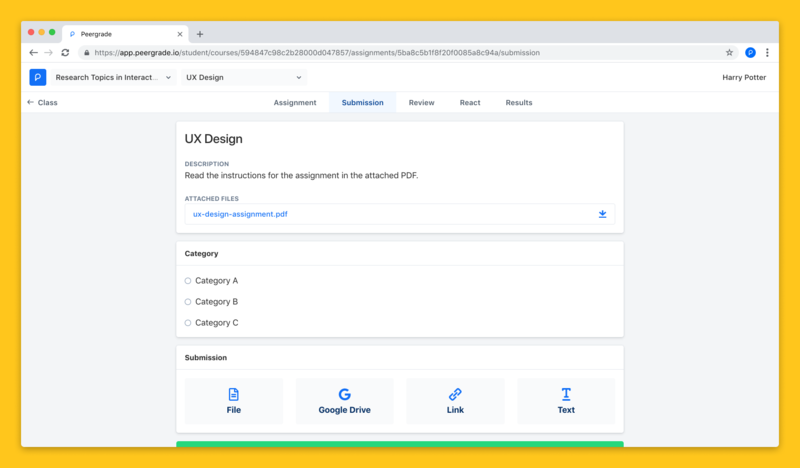 By default the student will pick their category when they submit their work for the assignment. However, If you wish to assign students to their categories yourself you can do so by selecting the first dropdown and change it from Students to Teachers. When you have done that you will get a list of all the students in your class on the left side. You can either drag & drop them into the category on the right side or you can click the small icon next to the student's name and select their category. If any students has not been assigned to one of the categories you have specified they will belong to the same default category. There are two settings for how categories will affect the allocation of reviews. By default students will be reviewing within their category meaning that students will only be allocated submissions from the same category they are in. 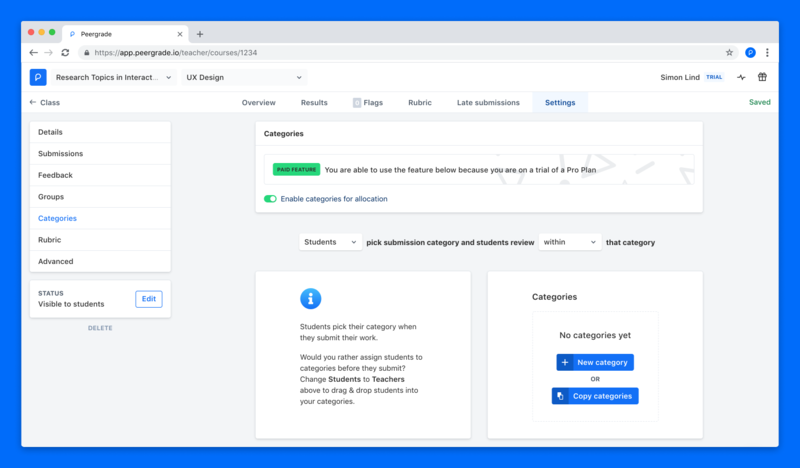 You can reverse this behavior by changing the dropdown from within to outside so that students in the same category will not get assigned submissions from their own category. If you have enabled student selected categories students will see the categories you have specified as options. The students need to pick a category in order to be able to submit the assignment. If you have pre-assigned students to categories the students will not see anything on the submission page. What happens if there is too few submissions in a category? Imagine the case where a student is asked to review 3 submissions from their own category, and there is only 2 submissions in total in their category. In this case the student will not be allocated 3 submissions to ensure that the category-rule is satisfied. Imagine a course where business leaders are participating from various different backgrounds. They all have direct competitors from their industries participating in the course and the teacher wants to make sure that people from the same industry do not review and see each other's submissions. The teacher can pre-assign students to industry specific categories and select reviewing outside of the category. This will ensure that students will only be reviewing submissions from industries that they themselves are not a part of.